After 7 grueling days of watching people bid on my best card so far, its finally time to say goodbye. 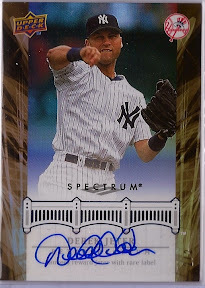 Today a little after 3pm eastern my 2/2 Derek Jeter Spectrum auto sold for 228.50 for my first Ebay sale ever. The price is about what I figured it would go for and I am very happy to get some money into the baseball card fund before the box battle with Mario. I must say that even though selling something on Ebay can be risky it is really fun at the same time. I sat glued to my computer hitting the reload button for the last hour of the auction. I'm glad that a feeling like that will never lose its gusto seeing as I don't plan on selling many cards I don't like to open cards and see dollar signs I like to open cards and see heroes,history, and a pastime.